These tarts have yoghurt in the pastry and the filling – buttermilk or sour cream would probably work for both (I haven’t tried it but I do substitute yoghurt for buttermilk or sour cream in a lot of recipes so imagine it would the other way). This pastry is a very buttery flaky pastry – make sure to buy butter than only has cream & salt as ingredients. Butter with water added can cause liquid to leak out of the tart while baking blind (pop a shallow baking tray under the tart tin to catch the drips). I made the pastry about six or seven times – sometimes the pastry was perfect and other times it leaked. I did some research and discovered not all butter is created equal when it comes to making pastry. We had a smoke-filled living room as the (inferior) butter dripped onto the bottom of the oven then burnt. The pastry will shrink slightly when cooked – the filling quantity allows for a little shrinkage. To get a pastry case the full height of the tart tin, trim the pastry about 1 cm above the top of the tart tin. Once the tart is cooked, you can trim the rough edges. As the tart case is deeper, you will need extra filling & egg mixture. Process the flour and butter together in the food processor until the mixture looks like breadcrumbs. Add yoghurt and pulse until the dough comes together. Tip out onto a lightly floured bench and lightly work the dough into a ball. Flatten into a disc shape, wrap with plastic wrap and chill for 30 minutes. Remove chilled dough from the refrigerator. Roll out on a lightly floured surface in a roughly shaped circle large enough to fit a 23cm tart tin. Place the pastry into the tart tin and gently mould the pastry around the edges of the base. Trim the top flush against the top of the tart tin. Cover with plastic wrap and chill for a further 60 minutes. Preheat oven to 200ºC/390ºF. Place the tart tin in a shallow slice tin. Bake the pastry blind for 15 minutes, then without the baking beans for a further 10 minutes. Remove pastry from the oven. It will have shrunk a little but that’s okay. 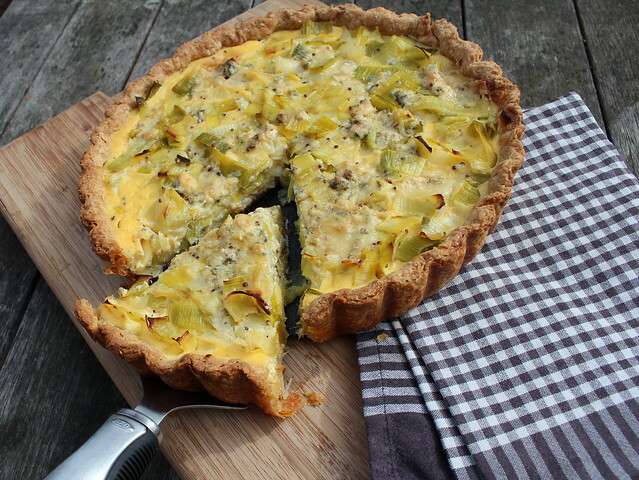 Slice the leeks into circles then wash well – I use the white & green parts of the leek. Tip out onto a clean tea towel to remove the moisture. Melt butter & oil in a heavy based sauce pan and add the leeks. Cook gently, stirring occasionally, until the leeks are soft – about 7-10 minutes. Beat eggs & cream together then whisk in mustard & yoghurt until combined. Scatter leeks over the cooked pastry case then pour over the egg mixture. Crumble Stilton and sprinkle over the top. Season with salt and freshly ground black pepper. Bake 180ºC/360ºF for 30 minutes then rest about 20 minutes before serving. Drain the tuna, discarding the oil. Break tuna up into smallish chunks. Briefly blanch the broccoli. Combine broccoli & frozen peas and set aside – the cold peas will stop the broccoli cooking & the heat from the broccoli defrosts the peas. Dice Camembert into 5mm pieces. Sprinkle tuna, broccoli & peas over the blind baked pastry case. Beat the eggs & cream together, then stir in the yoghurt. Pour over the tuna mixture, then evenly distribute the Camembert over the top. 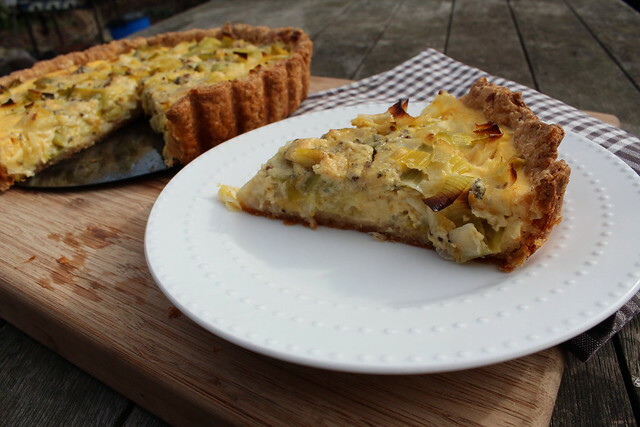 Bake as for the Leek & Stilton tart. Top and tail the beetroot, then place in a medium-sized saucepan with water. Bring to the boil, then turn down and simmer until cooked. Slip the skins off the beetroot and cut into 1cm chunks. Crumble the Feta into smallish pieces. Roughly chop the walnuts then place in a medium pan. Cook over medium heat, tossing, until they are toasted and fragrant. Sprinkle beetroot, Feta & walnuts over the blind-baked pastry case. Beat the eggs & cream together, then stir in the yoghurt. Pour over the beetroot mixture then bake as for the Leek & Stilton tart. This entry was posted in Mains, Savour, Winter and tagged Beetroot Feta & Toasted Walnut Tart, Leek & Stilton tart, Tuna Pea & Broccoli Tart, Wholemeal Yoghurt Pastry by Jo Dohrman. Bookmark the permalink.